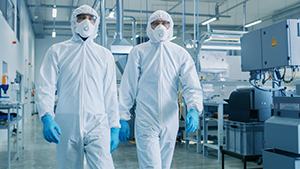 The National Institute for Occupational Safety and Health (NIOSH) has released four tools to help companies control possible exposure of nanomaterials to their workers. Workers in industries that use or make uniquely engineered nanomaterials may inhale nanoparticles on a daily basis, posing a potential respiratory risk. Each workplace design solutions document provides key tips on the design, use, and maintenance of exposure controls for nanomaterial production and use.